The above info came from Akari Sakura, and was edited by yours truly (contact me). 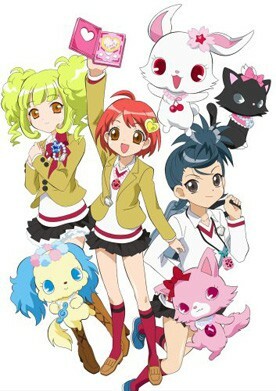 Jewelpet Tinkle is the second story arc ini the Jewelpet series. Akari is late for school, but on the way she passes in front of the sea and meets a talking rabbit named Ruby. She continues on to school, Jewel Academy, a magic school in Jewel Land. Akari and Ruby become partners and practice for Jewel Stars Grand Prix. Every magic student must earn 12 jewel stones to participate to grand prix. At the Jewel Stars Grand Prix, Akari and Alma are the two finalists and Akari ends up beating Alma. The prize for winning the grand prix is to realize three wishes. The above description came from Akari Sakura, and was edited by yours truly (contact me).